Instagram has begun banning paid-for likes and followers, in an effort to restore trust among the popular platform’s users and advertisers alike. The Facebook-owned social network will use new “machine learning tools” developed to help uncover the identities of “suspect” users. Instagram will begin removing inauthentic likes, follows, and comments from accounts believed to be employing third-party services to boost popularity and follower counts. In a blog post, Instagram said this is part of a greater effort to maintain an “authentic” platform. The move comes as social media sites, including Instagram’s parent company Facebook, face increasing criticism over the presence of trolls, fake news and misinformation on their platforms. Earlier this year, Twitter purged tens of millions of accounts from users’ follower counts. These accounts were previously locked due to suspicious activity. Users can sign up for such services by providing their username and password in exchange for more likes and followers. These services use bots that leave comments and like posts on real Instagram accounts, often for a fee. Some popular apps utilised by users to boost their followings have been recently shut down, but others that pay monthly subscription fees are still available, website Techcrunch reports. Accounts that use such third-party apps will receive a message notifying them inauthentic likes, follows and comments have been removed from their posts and account. Users will be prompted to change their password and revoke access for the popularity boosting service in order to secure their account. 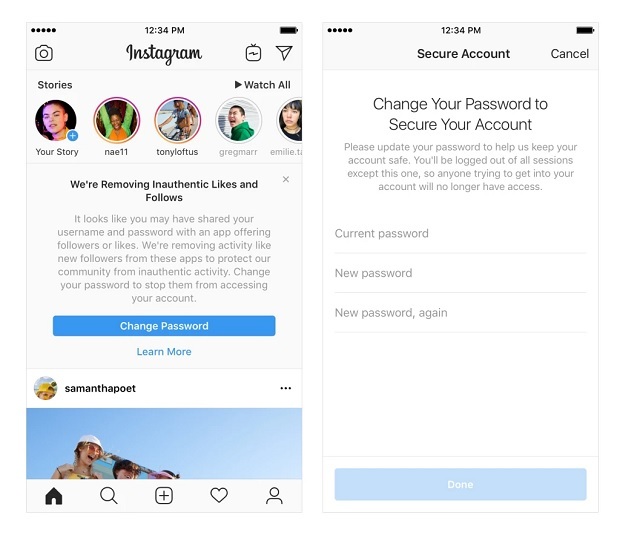 Instagram acknowledges some users may have unintentionally shared their log-in information with third-parties.